All of our research is designed to support our and others' conservation work. We have learned to recognise hundreds of reticulated giraffes individually in order to study in detail their behaviour and social interactions. In the future, we plan to analyse DNA samples so that we can examine the effects of relatedness on their social organisation. We are also looking at the ways in which reticulated giraffes communicate with one another. We know that they are not mute, as is commonly supposed: they make audible alarm calls, for example, when they are threatened by predators. Studies in captivity have suggested that giraffes also generate infrasonic signals, below the range of human hearing, and we are investigating this possibility in the wild. Data from our studies of known individuals, from our partners and from our network of contributors are fed into a central database to construct as precise as possible a picture of what is happening to the population as a whole. 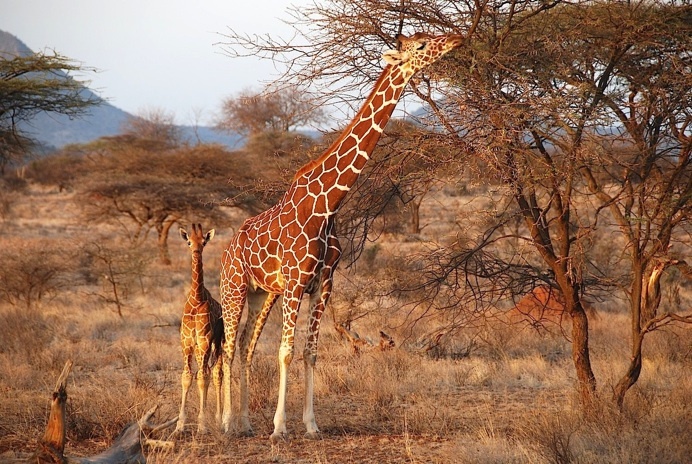 This work encompasses the entire remaining range of reticulated giraffes in the north-east of Kenya, southern Ethiopia and south-western Somalia. 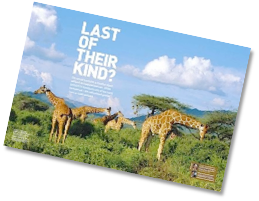 We think that they have disappeared from many of the places where they used to be found and that they are now restricted largely to protected areas in Kenya. If you have photographs of reticulated giraffes in the wild and would like to help, please send them to this address (or by Dropbox), together with any information you may have on where and when they were taken. We plan to fit a representative sample of reticulated giraffes with small electronic devices that will allow us to better understand their movements and their use of landscape and resources. Ordinary collaring techniques are ill suited to giraffes, however, and conventional immobilisation and capture is not only extremely stressful to the animals but also involves high risks to them of injury and even death. In order to avoid this, and to ensure that the resulting data are reliable, we set ourselves the challenge of developing a novel and non-invasive deployment method that has no effect on the giraffes' wellbeing or behaviour. We have now prototyped and tested our new technique and we are waiting only for the necessary permissions to put it into effect.